The holy grail of all newspaper tear predictions. 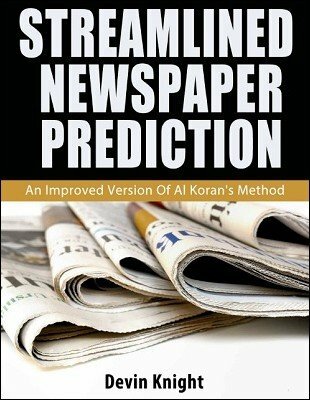 Even Al Koran would have been amazed, if he knew of this version. Are you one of the thousands of magicians who have tried to learn one of the newspaper tear predictions and threw up your hands in frustration trying to learn complex tearing systems and trying to memorize confusing sequences of tears? That is all about to end with Devin Knight's amazing streamlined tear, which you can learn to do in just a few minutes. You can do this without having to memorize complex tearing tables or do complex math in your head, as with almost every other method you may read in books. No wonder, this great effect is seldom seen or performed. It is just too difficult to master for most magicians and mentalists...until now! Now, it is so easy to do, you will amaze yourself. Effect: The performer says prior to the show, he wrote a prediction on a slip of paper. He shows the audience this prediction and places it in full view on a table before the effect begins. Any spectator is invited to help. No stooges, instant stooges, or pre-show work. The participant is asked to think of a number from 1-16, but not to tell the audience or say it aloud - instead he writes it down. The participant is then shown an ungimmicked sheet of newspaper. The performer then tears that newspaper sheet in half four times, resulting in a stack of 16 torn papers. This stack of torn pieces is placed on a table in full view and you never touch them again! Your participant then announces aloud to the audience, the number he thought of. NOTE THAT THE NEWSPAPER IS TORN INTO 16 PIECES BEFORE THE PARTICIPANT ANNOUNCES HIS NUMBER TO THE AUDIENCE. Your participant then counts down into the packet to the number he freely thought of. The number selection is fair; there is no math or force of any kind used to select a number from 1-16. Whatever number he freely names aloud is used. The participant, (not the performer) then counts down into the packet of torn papers and removes the piece at the number he just named. Your participant is then asked to verify that the torn piece has words printed on both sides. There could be an article on both sides. He is then asked to freely choose either side to read from. He is asked to look over that side and call off words that would be unique to that article. Names of people, numbers, company names, etc. As he calls out this information, the performer writes the words called out on a large piece of cardboard so the audience can see and remember the words. The prediction slip that has been in full view is opened by your participant and read aloud to the audience. Written on the slip of paper are the random words your participant just called out. This is one of the strongest and most impossible-looking prediction effects you will find. Strong enough to close a show. NO DUPLICATE PIECES, NO SWITCHES OF THE TORN PIECE, NO NAIL-WRITERS, NO SECRET WRITING AT ANY TIME, NO COMPLEX FORMULAS TO LEARN, NO SPECIALLY PRINTED NEWSPAPERS. Use any borrowed newspaper. Believe it or not, this streamlined tearing key has been reduced to just 4 rows, consisting of only 4 numbers. This cue list can be easily hidden. All it takes is one quick glance to know how to quickly tear the newspaper into 16 pieces. So easy, so simplified, that you can almost do the tears without having to think about it once you grasp the basic concept. No need to have a cue list either. Devin shows you how to easily remember these 4 rows, with 4 numbers. If you know that a dime is worth more than a penny, then you can memorize this cue list in just a few minutes. This streamlined system is so easy to use, you will marvel over how Devin created such a system that works infallibly. If you don't want to memorize then just have the 4 rows on a small card that can be about 1 inch. It only takes about one second to see what you need to know. Once you learn this, you can do it anywhere using a piece of newspaper given to you. Jot a prediction and you are set to perform. 1st edition 2016, 29 pages. At $8 this was a bit hard to resist particularly with Devin's track record. Well after reading this all I can say is this is grossly underpriced. The description above is completely accurate. The tearing procedure is completely natural and innocent and yet extremely easy to remember. You can practically pick up a newspaper and perform this impromptu. For me this is a perfect compliment for my eStooge dice as I can know the number before the spectator does. This was money very well spent. There have been numerous instructors who explained how to tear a newspaper page so that it yielded a piece of newspaper that bore words that had been already predicted by the performer from the beginning, and where its place in the stack of newspaper pieces corresponds to a number chosen at the beginning by the spectator. Devin Knight has actually streamlined the performance of this effect and made it easier for the mentalist to learn and easier to perform. The other versions of this effect have been surpassed and outdone by Devin's ingenuity and by his crystal-clear instructions that are to the point, and which at every step focus on how the effect looks to the mentalist, guiding the reader to giving an applause-worthy performance. This is, now, the best way to achieve the full entertainment value and the full mystery inherent in this effect. Devin Knight has taken this classic effect and both modernized it and simplified it, bringing it within the abilities of today's performer.